Mitsubishi Corporation (MC) and Chiyoda Corporation (Chiyoda) are pleased to announce that MC (through its subsidiary Diamond Generating Europe), Chiyoda (through its subsidiary Chiyoda Generating Europe), EDP Renewables, Repsol, and Engie have agreed to participate in floating offshore wind farm project in Portugal (WindFloat Atlantic Project), by acquiring a stake in Windplus, S.A., the project owner. MC and Chiyoda will hold a 20% share respectively in the project. The project, located 20 km off the Portuguese coast at Viana do Castelo, is planned to be operational in 2018 and will consist of 3 or 4 wind turbines on floating foundations, accounting for a total capacity of 25 MW. WFA will benefit from the support of the European Commission, through the NER 300 program, and of the Portuguese Government through the Portuguese Carbon Fund. It was also selected for the InnovFin program by the European Investment Bank. 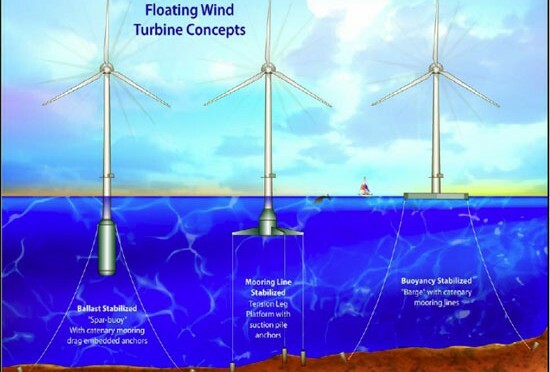 The consortium will use the WindFloat technology, an innovative semi-submersible foundation developed by Principle Power, Inc. This technology was already implemented in a first of its kind prototype called WindFloat 1 near Povoa do Varzim. It comprises 2 MW Vestas V80 commercial wind turbine mounted on a WindFloat floating offshore wind turbine foundation. The prototype has already produced more than 16 GWh over almost four years of operation – performing excellently through extreme weather conditions. Its successful results have been key for the creation of this consortium and the launch of the WindFloat Atlantic project, the aim of which is to demonstrate the economic potential and reliability of this technology, advancing it further in the path towards commercialization. MC is currently undertaking an offshore wind farm project in the Netherlands and is engaged in offshore transmission cable operation projects in the UK and Germany. MC intends to continue actively developing its power generation and transmission businesses, including in the renewable energy sector in Europe, as part of its aim to increase global power generation assets from the current 5GW to 7.5GW. Chiyoda, under its Medium-Term Management Plan 2013, as growth strategies, sets a goal of acceleration of investment as well as the expansion of its business field into renewable energy, and participating in the development of the project is Chiyoda’s first entry into full-scale investment in overseas power business. Aiming to achieve harmony between energy and environment, Chiyoda seeks a further contribution in the renewable energy. Mitsubishi Corporation (MC; TSE: 8058) is a global integrated business enterprise that develops and operates businesses across virtually every industry including industrial finance, energy, metals, machinery, chemicals, foods, and environmental business. MC’s current activities are expanding far beyond its traditional trading operations as its diverse business ranges from natural resources development to investment in retail business, infrastructure, financial products and manufacturing of industrial goods. With over 200 bases of operations in approximately 80 countries worldwide and a network of over 500 group companies, MC employs a multinational workforce of nearly 60,000 people.